Featuring pavilions from 140 countries, EXPO Milano expects to welcome more than a million visitors through October. I was one of them: I recently traveled to Italy, and had a delicious opportunity to explore this historic World’s Fair devoted to sustainable food production, and to tour a few of the amazing regions of Italy. The Tree of Life is the heart of EXPO Milano and the Italian Pavilion. The EXPO Milano grounds are stunning, a platform for world-renowned architects to showcase their talents and for chefs to share food from across the globe. Located adjacent to the Italian Pavilion, it is a striking metal and wood sculpture that integrates with spectacular lighting, fountains, music, and multi-media effects. It also connects to the adjacent ponds and canals, trees, nursery plants, and of course, the food and wine of Italy. The United Kingdom Pavilion centers on Wolfgang Buttress’ representation of a beehive and the importance of bees to the web of life. The United Kingdom pavilion is one of the most visually stunning pavilions. Designed by artist Wolfgang Buttress, it included a metallic honeycomb-like structure that symbolizes the roles of bees at the center of our food chain. The exhibit is designed to usher visitors through the life of a honeybee as it travels through an orchard of traditional British apple trees and a wildflower meadow with sorrel, buttercups, and other natives to the UK. The threats of pollinator decline and colony collapse play an important role in the educational experience. Author/activist Vandana Shiva plants okra, melon, and calabash seeds at the opening of the Biodiversity Pavilion at EXPO Milano. The Biodiversity Park and Organic Pavilion maintains the theme of the Fair and is one of its significant components. The Park — designed to simulate a trip across the Italian peninsula and its vast biodiversity –includes plants such as myrtle, olive, rosemary, mint, lemon, artichokes, rhubarb, sage, and fennel. Vandana Shiva, a farmer and prominent Good Food activist from India, stated at the exhibit opening, “Organic agriculture practices are the first step in restoring fertility to the soil.” Accordingly, the Organic Pavilion includes a representation of food production systems that are “ecological, secure and sustainable” and contains products across all food categories, including produce, meat, dairy, grains, beans, and more. Pavilion USA includes a vertical farm with plants harvested daily for use in the onsite café. The pavilion, in a nod to one of the major innovations in growing, includes a nearly 10,000 square foot vertical farm producing 42 varieties of vegetables, grains, and herbs. Our trip was organized by the Italian Trade Agency and included an eclectic delegation of American food leaders: chefs, a farmer’s market director, wine merchants, farmers, and others, exploring the joys of Italian food in the country’s northern regions. 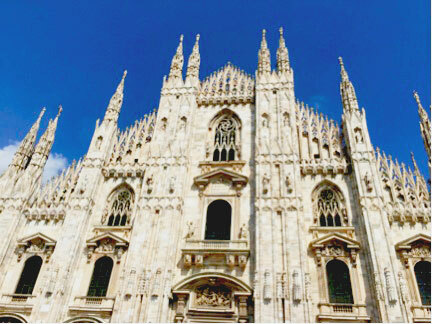 The Milan Duomo is one of the world’s largest and greatest Gothic buildings. Milan, the starting point, is Italy’s second largest city and its center of fashion, industry, and finance. It also has a world-class cultural scene and is rich with history: The refectory of the Santa Maria della Grazie church houses Leonardo da Vinci’s The Last Supper. The Milan Cathedral, or Duomo, is one of the world’s largest Gothic structures. Next to the Duomo is Galleria Vittorio Emanuele II, one of the world’s oldest and most visually stunning shopping malls. The glass-covered 19th century arcade is home to high-end retailers and restaurants. During EXPO Milano, the Galleria features a pop-up restaurant operated by the James Beard Foundation with dinners by leading chefs including Tom Colicchio, Rick Bayless, and Ming Tsai. Da Giacomo, a favorite restaurant in Milan, featured traditional local fare such as branzino, porcini mushroom risotto, squid ink pasta with anchovy, fried zucchini flowers, and cannoli. Marcel van Ooyen (left) is executive director of Grow NYC (operator of Greenmarkets, the largest farmers market network in the U.S.). Paul Hardej (right) is a vertical farming pioneer who co-founded Chicago’s Farmed Here. 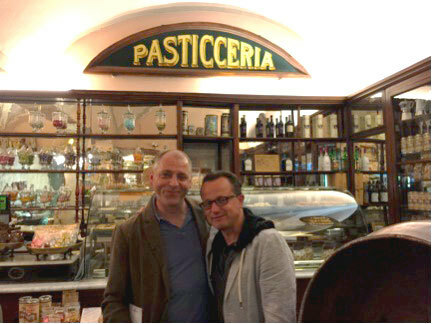 They are seen visiting Pasticceria Barbero in Alba. Our tour took us to the Piedmont region, home base of the Italian Slow Food movement and center for sustainable food and wine. It included a visit to Beppino Ocelli, who produces Langa and Alpe cheese from the milk of cows, goats, and sheep that spend their lives in Alpine pastures. It is some of the finest cheese (and butter) I ever tasted, reflective of the region’s unique terroir (and in some cases combined with local Barolo wines and truffles). The day continued at Pasticceria Barbero in Alba, a converted soda fountain from 1881. It boasts one of Italy’s top chocolatiers, featuring a specialty of dark chocolate and toasted local hazelnuts. Wine explorations continued at the 13th Century Castle Grinzane Cavour, a UNESCO World Heritage site and museum. One of the finest food days I have experienced culminated at the Michelin-starred Ristorante Trattoria della Posta, operated by the founder’s great-grandson. Located in hills and vineyards on the outskirts of Alba, it features regional ingredients such as rabbit, truffles, pasta, cheese, and Piedmont wines and grappa. 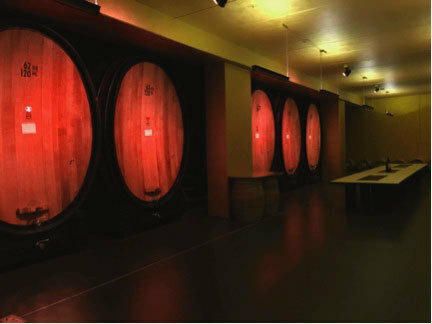 The casks at Meran Burggräfler, a regional wine cooperative in the South Tyrol region of northeast Italy. Our next day began in Balzano in the northeastern corner of Italy. Nestled in a valley surrounded by the dramatic Dolomite Mountains, Balzano has experienced Italian, Austrian, and German rule at different stages, and it has a delightful mixed heritage and food culture. Lunch was at PUR Suditrol, a gourmet store featuring all local (and many organic) foods of the South Tyrol region. A visit to the Pfitscher Speck and Sausage facility provided delicious insights into the area’s traditional pork production and smoking methods. At Meran Burggräfler we experienced award-winning wines from a regional cooperative of farmers. Dinner in the town center of Balzano was at Wirtshaus Vögele, which dates to 1277; it featured local organic ingredients and some of the best potato fritters ever. 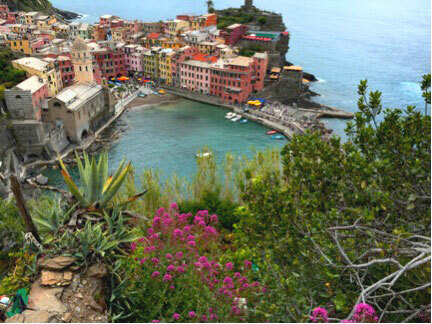 Vernazza is the loveliest of the five coastal towns that make up the Cinque Terre. 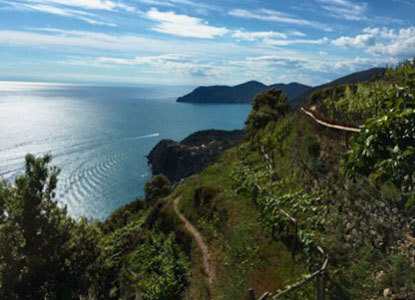 There’s no place better to conclude an Italian Good Food adventure than Cinque Terre. A rugged portion of the Italian Riviera south of Genoa, it consists of five charming villages that make up the Cinque Terre National Park, a UNESCO World Heritage site. The towns are primarily accessible by train, boat, and trail, with little automobile access. I was guided on hikes between the villages by Nelly Scapparone, a manager of the National Park and native of Monterosso, the largest of the five towns. The walking tour highlighted the traditional use of terraces to grow grapes, olives, lemons, hazelnuts, cherries, and lush gardens that provide residents with an abundance of regional food and wines. Dinner at L’Ancora della Tortuga included Ligurian pesto, three different styles of anchovies, and two whole fish caught locally earlier in the day and roasted on a slab of sea salt. It was a fitting end to a spectacular trip, and I am grateful for all who made it special! 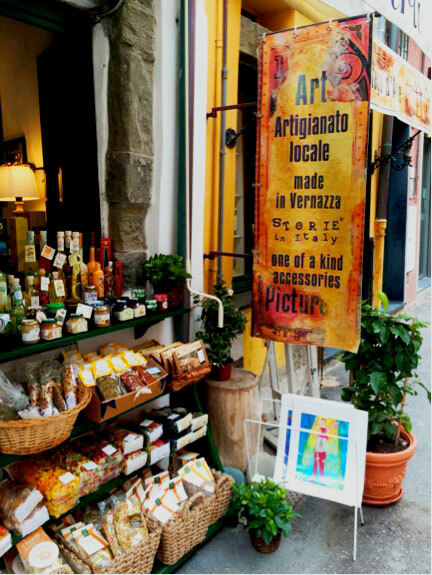 The terraces of Cinque produce a vast array of foods sold locally and abroad. Photographs of EXPO Milano courtesy of EXPO Milano. Other photographs by Jim Slama. Jim Slama is president of FamilyFarmed, a Chicago-based non-profit, and is the founder of the Good Food Business Accelerator and the Good Food Festival & Conference. This entry was posted in Global Good Food Movement, Good Food movement, Sustainable conferences and tagged EXPO Milano, FamilyFarmed, Global Good Food movement, Good Food movement, Italian Trade Agency, Italy, James Beard Foundation, World Exposition in Milan. Bookmark the permalink.